Some Form of Gum Disease Affects About 80 Percent of Adults. 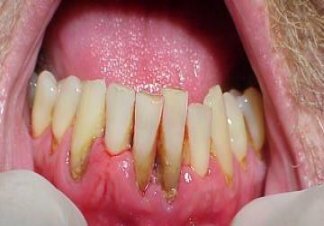 Red gums, puffy or bleeding gums can be the first signs of gum disease. Also be aware of bad breath that doesn't go away, painful chewing, or loose and sensitive teeth. “For many years, dental professionals believed that gum disease was solely the result of a bacterial infection caused by a build-up of plaque between the teeth and under the gums. Research suggests Chronic Inflammation links periodondal disease to many other diseases. When your gums are inflamed, bacteria from the mouth are getting into the bloodstream. This leads to an increased risk for serious health problems. Suggesting that chronic inflammation itself may be the basis for the connection. In clinical trials, people suffering from the most severe form of rheumatoid arthritis found they felt less stiff in the morning when they had cured gum infections. If we eliminated the gum infection and inflammation, then, patients with active rheumatoid arthritis reported improvement in the symptoms of the disease. Researchers Have Found That People With Gum Inflammation Are Almost Twice As Likely To Suffer From Coronary Artery Disease. Bacteria from the mouth can get into the bloodstream when the gums are inflamed. These bacteria can dramatically increase your risk for a heart attack. Studies show that people with gum inflammation are also more likely to have strokes. The bacteria that collect in your mouth when periodontal disease is present can also cause pneumonia and other respiratory diseases. The presence of gum inflammation can make it much more difficult for a diabetic to control their blood sugar. Elimination of any gum inflammation can directly improve diabetic control. The research shows that periodontal disease can cause bacteria to enter the bloodstream and activate cells that produce inflammatory biological signals that have a destructive effect throughout the body. Women with gum infection are seven to eight times more likely to give birth prematurely to low birth weight babies. Researchers believe that periodontal disease causes the body to release inflammatory chemicals which are linked to pre-term birth. Periodontal disease should be seen as a signpost for exposure to inflammation, which in turn can go on to damage brain tissue and lead to dementia... Even Alzheimer's Disease.- Alzheimer's Assn Int'l Conference on Prevention of Dementia, Washington, D.C.
All of this research is proving you should do what ever you can to eliminate inflammation anywhere in your body! Gum Disease and Erectile Dysfunction. A new study - from the Journal of Sexual Medicine - found an "association" between periodontal disease (gum disease) and ED (Erectile Dysfunction). Taking a quality Omega 3 Fish Oil Supplement. Boston University scientists say that they have discovered a new family of biologically active products of omega 3 fatty acids, which can resolve periodontal inflammation and restore the gums to health. The researchers point out that oil from fish contains (EPA) and (DHA), both of which are omega 3 fatty acids. They underscore the fact that these omega 3 fatty acids are often used to help people with various inflammatory conditions. In a previous study, the researchers have already found that compounds derived from EPA provide protection against soft tissue and bone loss associated with gum infection. They also restore the lost soft tissue and bone to healthy levels. Said Michael McGuire, D.D.S., president of the American Academy of Periodontology (AAP). "Do not take your gum health for granted or you may have more to lose than just your teeth." "Periodontal inflammation and inflammation throughout the body are very much associated with one another," he said. While studies don't prove cause-and-effect, it's reason enough to recommend a heart-healthy diet that's also good for your gums. Link between gum disease and pancreatic cancer.